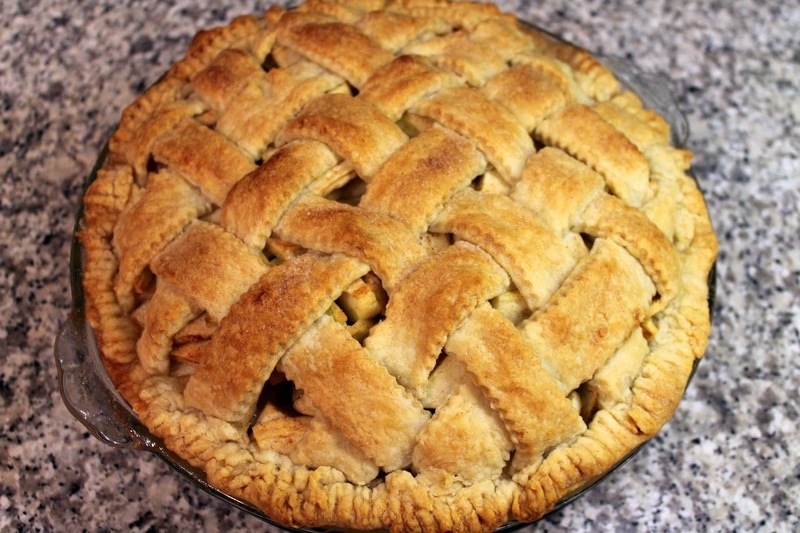 Pumpkin pie and pecan pie are wonderful things, but for Thanksgiving, my heart truly belongs to apple pie. It's just got to be there, the final touch to a wonderful meal. 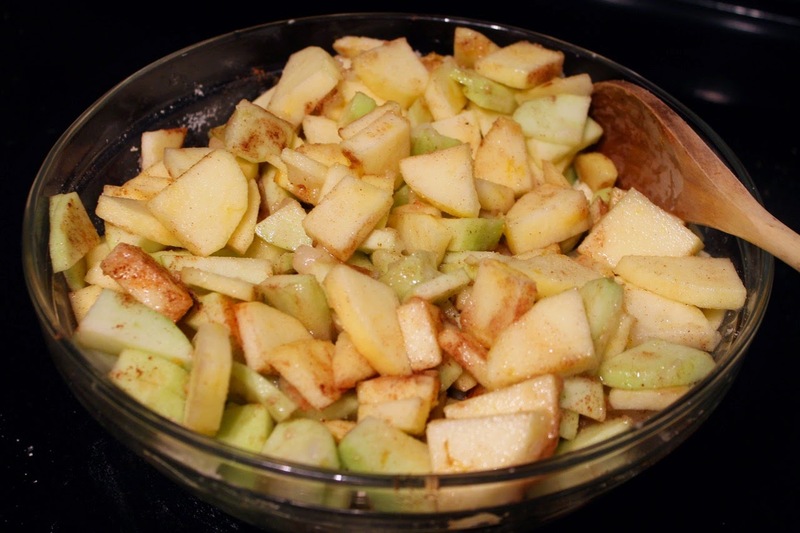 A couple years ago, I made an Apple Pie with Vodka Crust, which proved to be very popular among readers (it even garnered a mention from the now-defunct New York Times Diner's Journal blog). The use of the vodka is a technique I learned from America's Test Kitchen. The alcohol inhibits gluten formation and evaporates faster than water alone, promoting a flakier crust. If you're concerned about taste, vodka is a good choice because it's nearly flavorless. However, this technique also provides the opportunity to experiment by using a more flavorful spirit--something that would complement the flavor of the pie. I chose rye whiskey, since it goes nicely with apples. For pumpkin pie, I might choose a dark rum. The real joy of this pie though is the lattice top. 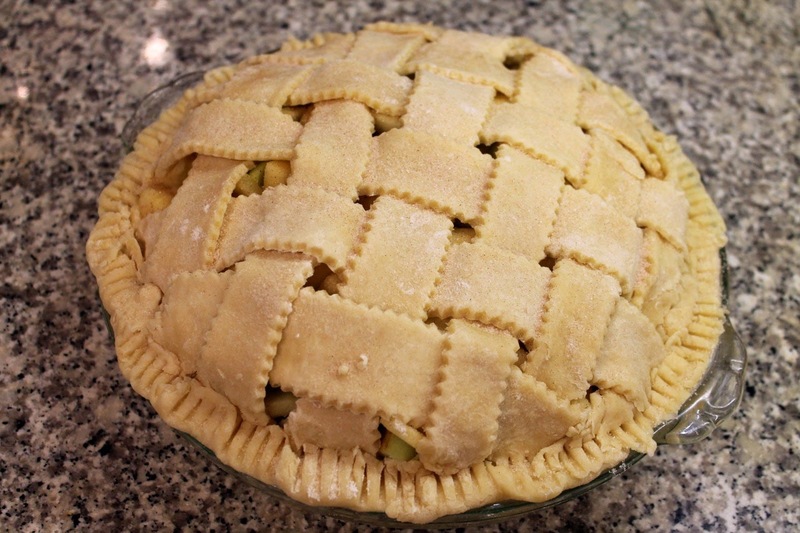 I almost always weave a lattice onto the top of my Thanksgiving apple pie. It's such a lovely look when it's done, and it's not hard to do. The most important thing to remember is to make the lattice while the dough is cold. Don't let it warm up, as it becomes too pliable and may tear easily. While you're rolling out the dough for the pie bottom, keep the other piece of dough in the refrigerator until you've filled the pie and are ready to make the lattice. Then roll it out and cut it into strips. I like to use a fluted pastry cutter wheel to give the edges that zig-zag look. 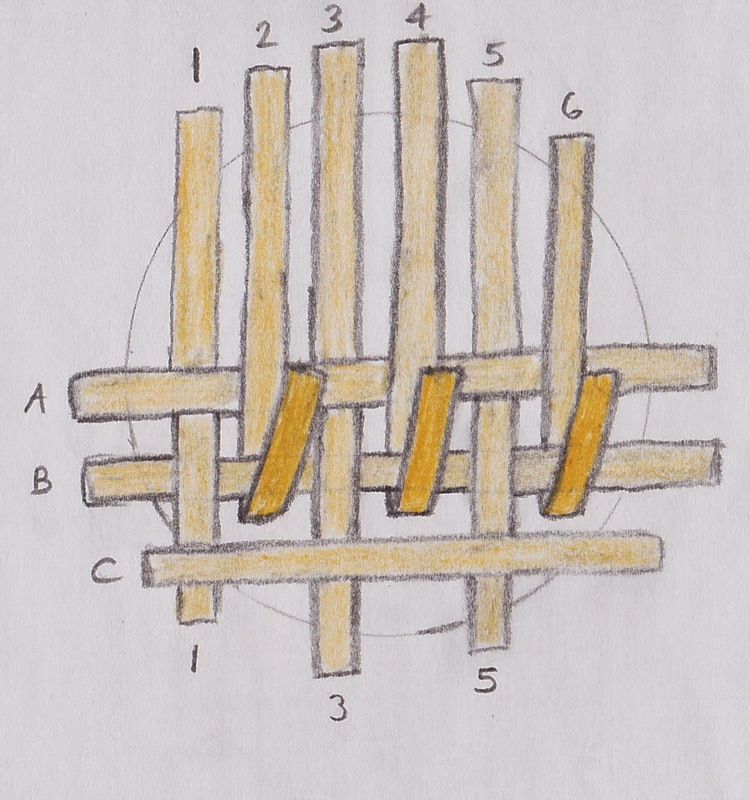 I've included instructions below for forming the lattice with drawings. If you want to see the process with photos, check out The Aubergine Chef's post about lattice pies. Pie with lattice ready for baking. 2. Sprinkle whiskey and very cold water over dough mixture. With the spatula, combine the liquid with the dough using a folding motion, pressing down on dough until it sticks together (use your hands a little if needed, but be careful not to overwork the dough). Divide dough into two pieces, roll into balls and flatten slightly to form thick 4-inch discs. Wrap in plastic and chill at least 45 minutes, up to 2 days. 3. Preheat oven to 425 F with oven rack in center position. Remove one disc of dough from the refrigerator and allow to warm slightly if stiff and very cold. On a floured surface, roll out the first disc to a circle with an even thickness and 12-inch diameter. Gently fold dough into quarters, lay in 9-inch pie plate and unfold so that dough has an even overhang around the rim of the pie plate. Refrigerate while preparing the apples. 4. Peel, core and chop the apples into 1/4- to 1/2-inch slices. Put in a large bowl and toss with the sugar, lemon juice, lemon zest and spices. Transfer the mixture to the dough-lined pie plate, mounding the fruit mixture in the middle. 5. Roll out the other dough disc to a circle with an even thickness and 12-inch diameter. 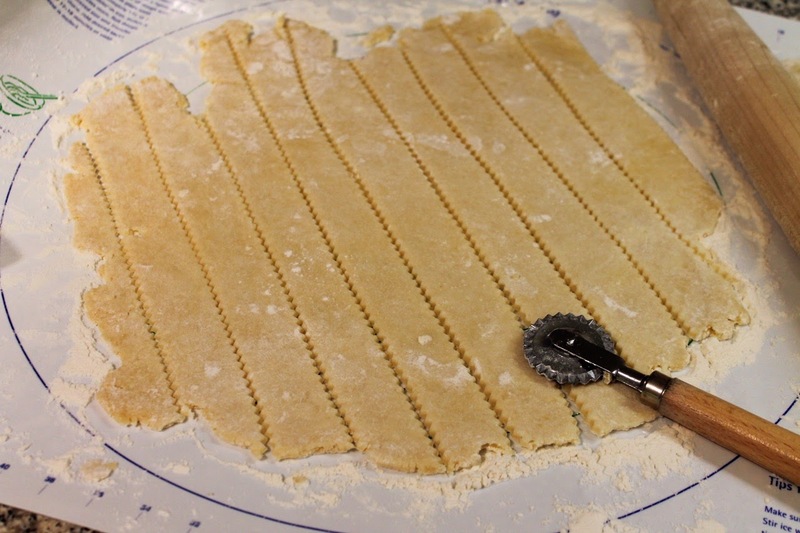 Using a pastry cutter wheel or knife, cut the dough into 10 to 12 strips about 3/4-inch wide. A. Place five or six strips over the pie in a row, leaving about 1/2 inch of space between each strip (if you only do five strips, omit strip 6 in the following directions). See figure 1 below. B. Fold back every other strip (stripes 2, 4 and 6 in fig. 2 below) halfway. 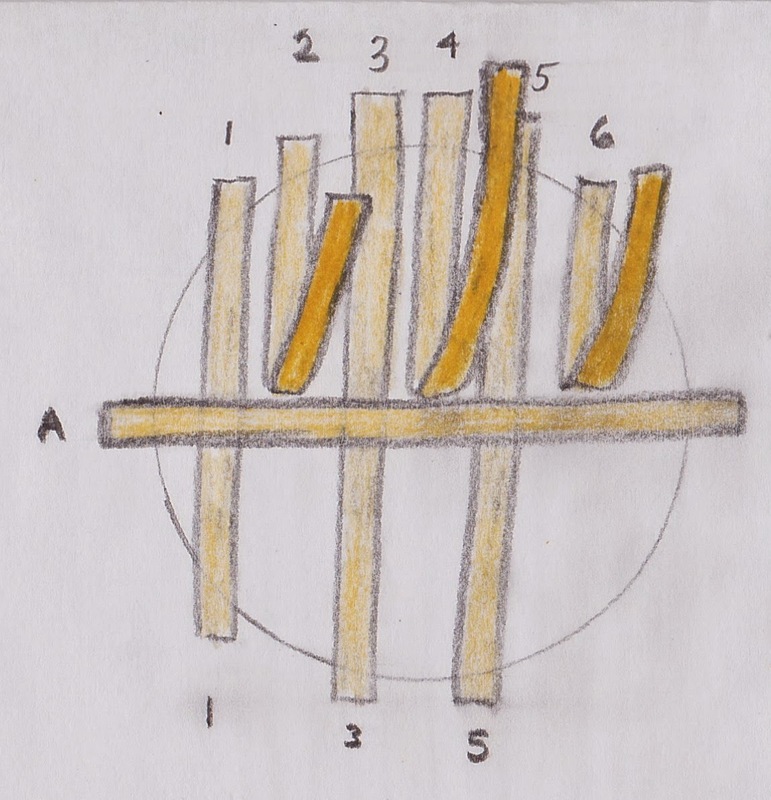 Place a strip (strip A) across strips 1, 3 and 5--the strips that you did not fold back (see fig. 2 below). C. Unfold strips 2, 4 and 6 back down over strip A. 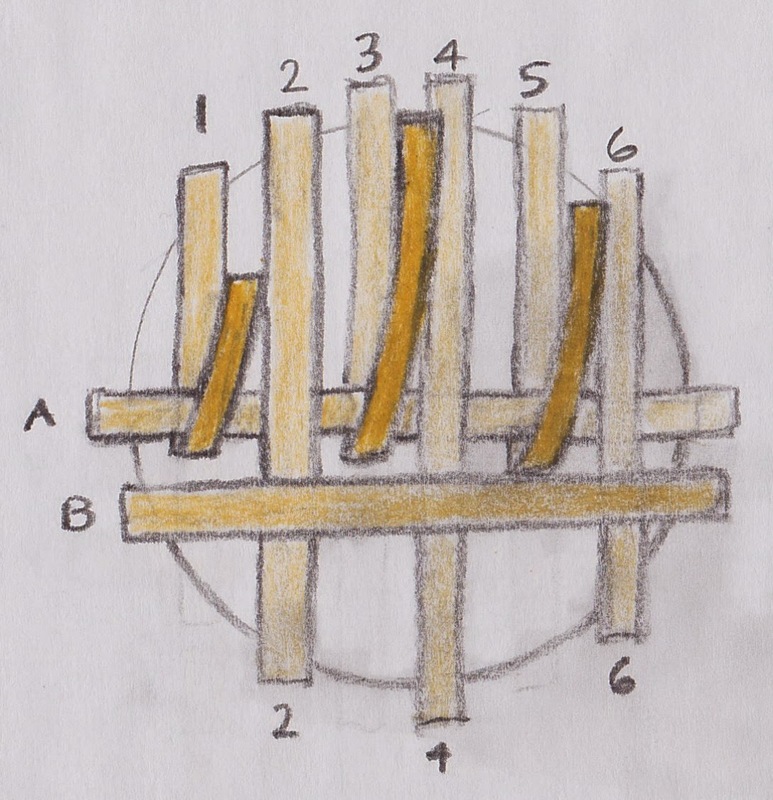 This makes the first weave: strip A is woven over strips 1, 3 and 5 and under strips 2, 4 and 6. 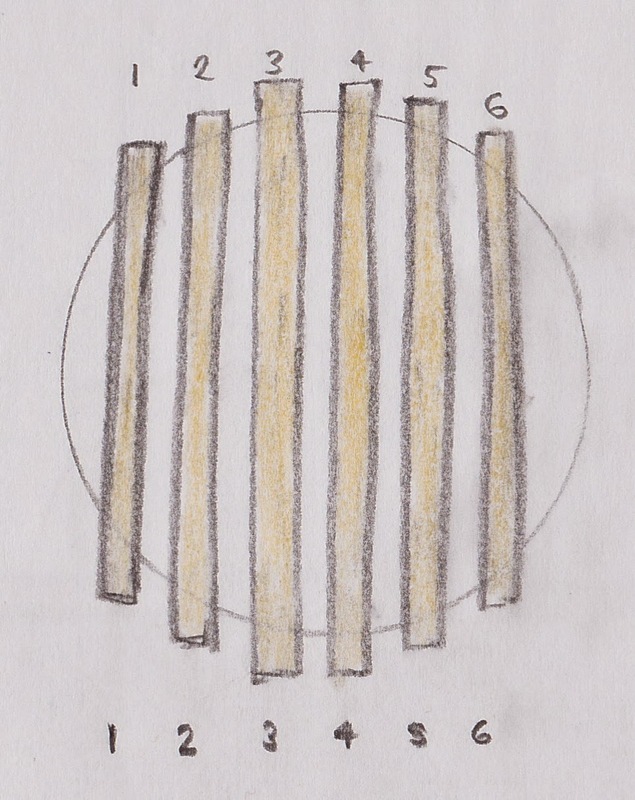 Next, fold back strips 1, 3 and 5 and place another strip (strip B) over strips 2, 4 and 6 (see fig 3 below). D. Unfold strips 1, 3 and 5 back down over strip B. Strip B is now woven over strips 2, 4 and 6 and under strips 1, 3 and 5--the opposite of strip A. Fold back strips 2, 4 and 6 and place another strip (a shorter one--strip C) over strips 1, 3 and 5 (see fig. 4 below). Unfold strips 2, 4 and 6 back down over strip C.
E. Continue weaving in two to three more strips, this time working from the top (the next strip, strip D, will go directly above strip A: fold back strips 1, 3 and 5 so that strip D would be woven under strips 1, 3 and 5 and over strips 2, 4 and 6. Alternate with strip E, and if you have space, strip F.
7. Trim the strips and bottom dough edges to 1/2-inch beyond the pie plate lip. Fold the 1/2-inch overhang over itself so the folded edge is flush with the plate lip, sealing in the ends of the strips as you fold. Use a fork to flute the edge, which further fastens the strips to the bottom pie crust. Sprinkle the top of pie with cinnamon-sugar. Place the pie on a rimmed baking sheet for baking (because the lattice provides larger holes than a top crust would, it's important to bake the pie on a bakings sheet in case it bubbles over). 8. Bake until pie is golden, about 25 minutes. Reduce oven temperature to 375 F and bake another 30-35 minutes (up to 45 minutes) until the pie is bubbly and golden brown. Remove pie from oven and place pie on a wire rack to cool.